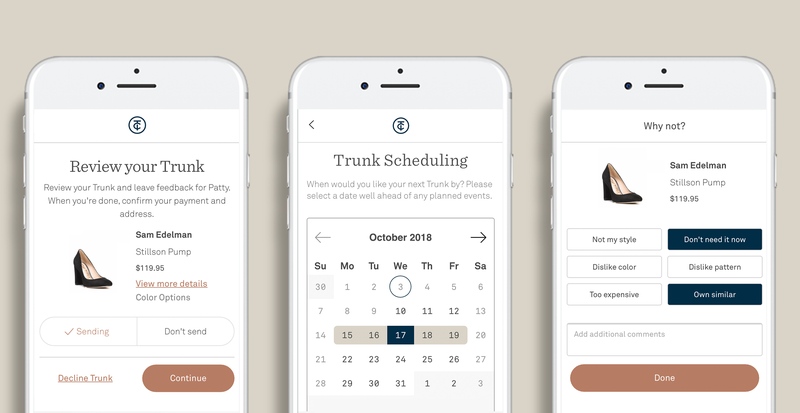 If you haven’t downloaded the Trunk Club app yet, we highly recommend it. 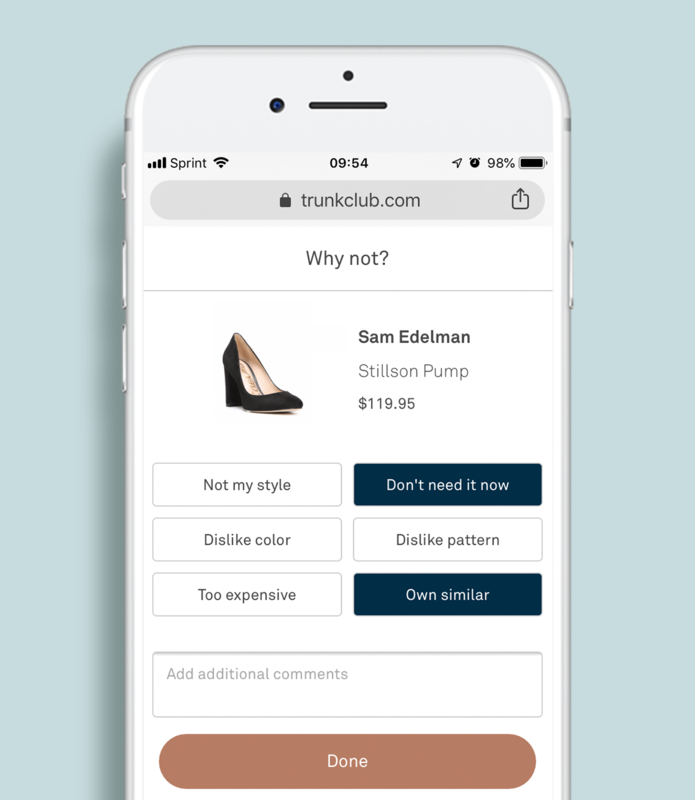 While chatting with your stylist over text or email gets the job done, there are tons of additional features on the app that really let you make the most of everything Trunk Club and your stylist have to offer. And don’t worry, it’s compatible with both Android and iOS. Speaking of chatting with your stylist, the Messenger feature is a great way to keep everything in one place. Messenger keeps all your conversations together in one long thread. 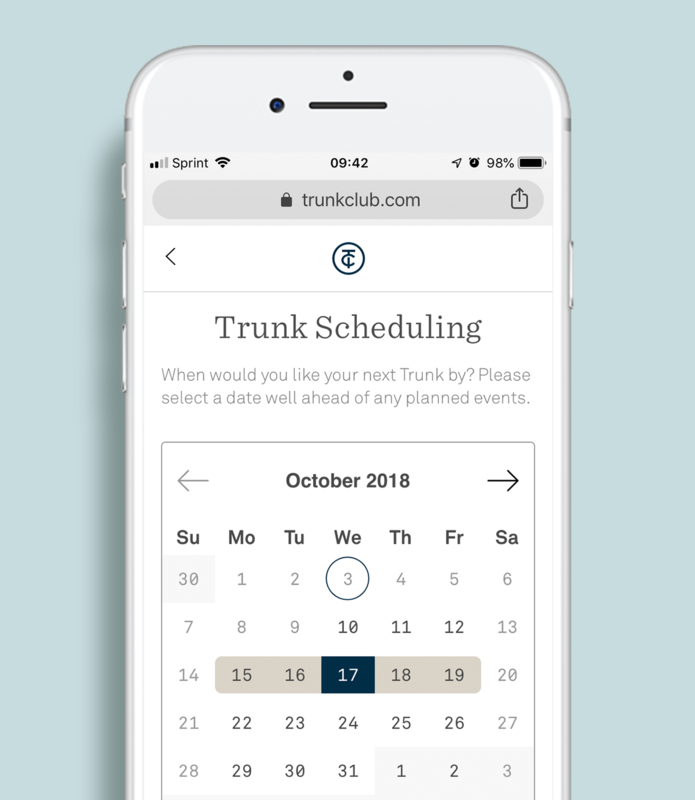 That means your request for a new Trunk, the pictures you send of outfit inspiration, your Trunk Preview, and advice from your stylist can all be found together. No need to sort through different threads or attachments. And it’s so quick, too! 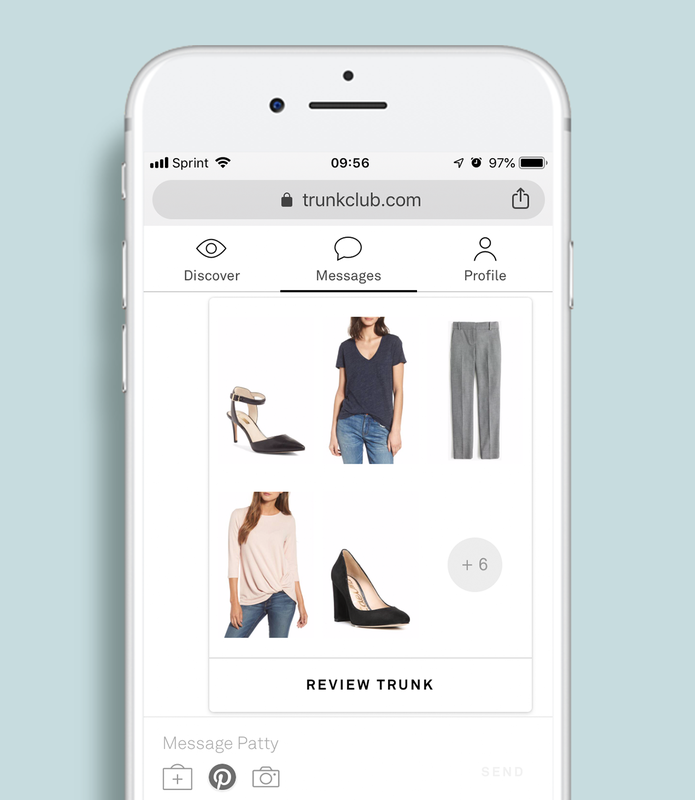 Instead of waiting for an email to come through, you can chat with your stylist in real time. You’ll even see when they’re typing, just like texting. Sometimes it’s hard to put into words exactly what you’re looking for, so why not show a picture? 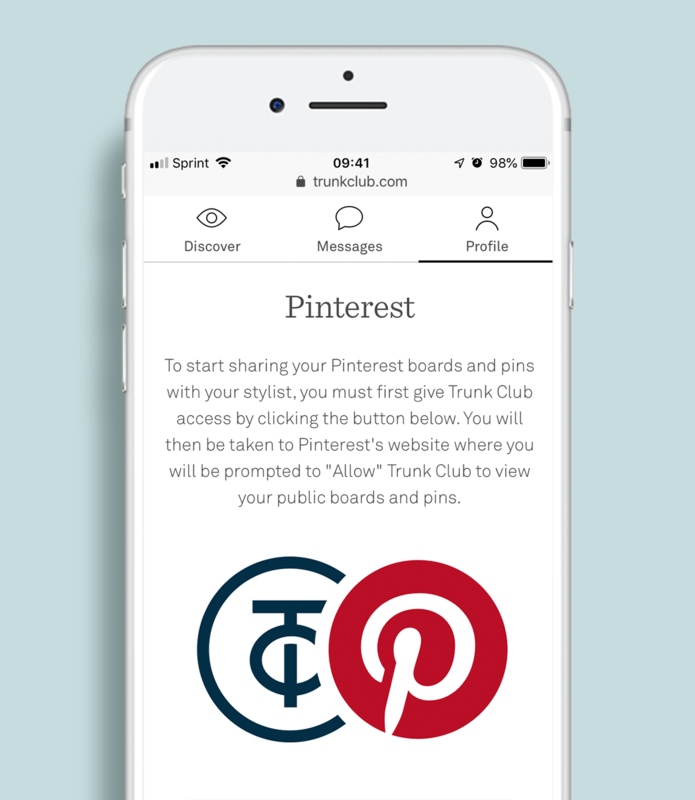 We’ve integrated Pinterest capability so that explaining your style can (literally) be as easy as sharing a board with your stylist. Once you do, your stylist can take a peek at your boards and get a better feel for who you are, what you like, and how to help you branch out in your wardrobe. If you’re ever feeling particularly inspired by a certain look you find on Pinterest (or elsewhere), you can always screenshot it and send it to your stylist via Messenger to recreate something similar. Never been a huge fan of suede shoes? Let your stylist know you prefer leather. Love the style of shirt, but green isn’t really your color? Check and see if swapping colors is an option. Once this first round of feedback is complete, not only does your stylist know you a bit better, but there’s an even greater chance you’ll find new pieces to keep. 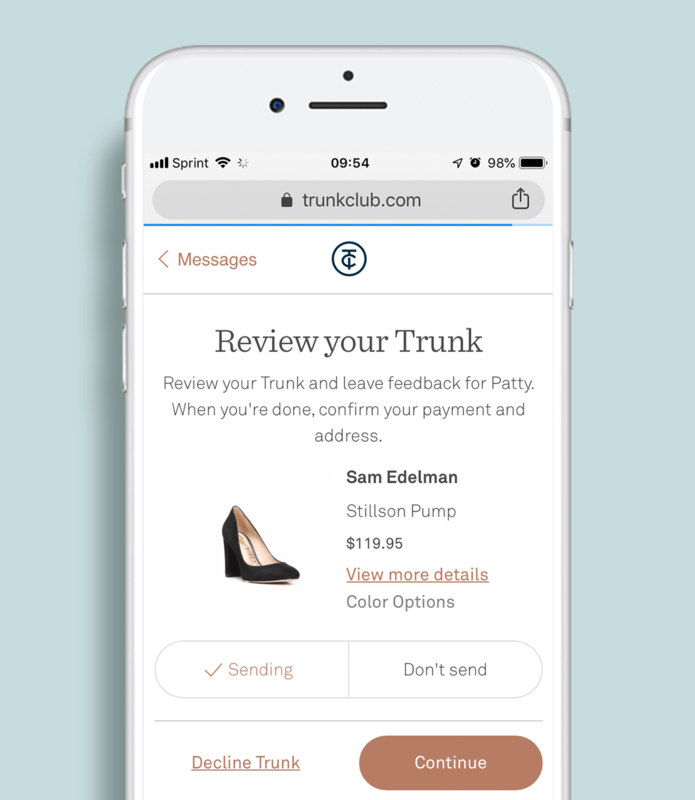 Feedback is incredibly important when it comes to your Trunks, and having the app makes it easy. Your first round comes from the Trunk Preview. Your second round of feedback is equally, if not more, important. That’s the feedback you give on the items you did and didn’t keep from your Trunk. So if you find out that you prefer not to have hardware on your moto jackets, let them know. And if you learn that copper looks great on you, they’d love to know that, too. Remember, our stylists are real people with real memories! So leaving specific, detailed feedback is an easy way for your stylist to learn about you and keep developing your personal style for future Trunks.